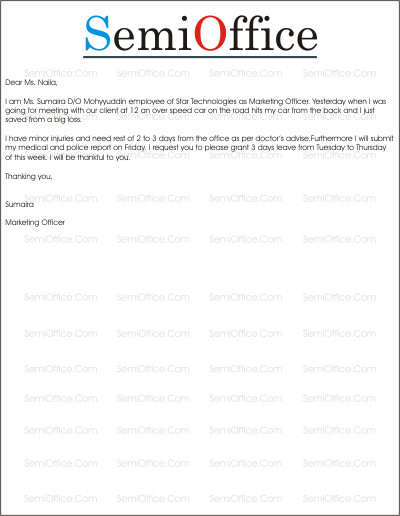 Samples of medical leave applications for many reasons from office, school, college, company, factory, mill, daftar etc. It is humbly stated that I am suffering from high grade fever since last Monday and not able to attend the office in current situation. I have also visited the hospital and got medical certificate which is attached herewith. In the light of above, you are requested to please grant me leaves on medical grounds so that I could get myself cured properly and come to office in a few days. I am Ms. Sumaira D/O Mohyyuddin employee of Star Technologies as Marketing Officer. Yesterday when I was going for meeting with our client at 12 an over speed car on the road hits my car from the back and I just saved from a big loss. I have minor injuries and need rest of 2 to 3 days from the office as per doctor’s advise. Furthermore I will submit my medical and police report on Friday. I request you to please grant 3 days leave from Tuesday to Thursday of this week. I will be thankful to you. I am Abdullah Student of MBA Marketing with enrollment number 34-mbe. Yesterday was going back to my home from College. A Passenger Bus hits my motorbike from the back and I got head injury on the left side. I was wearing safety helmet which saved me a lot. I am admitted in hospital since last evening and doctor says it may take two weeks for full recovery. During this period I can’t attend my college. My medical report from the hospital are attached with this application and I request you to please allow me and consider this as informed medical leave for two weeks leave from the college.